Imperial Berliner with Mango, Guava, and passion fruit. Nice straw pour, but wow this is a passionfruit, mango tropical bomb. Unreal nose on this one. Taste is as amazing as the smell, super sour, passion fruit and mango, very dry and very long finish. Probably the best Berliner you will find, superb. Big white head, yellow-pineapple body. 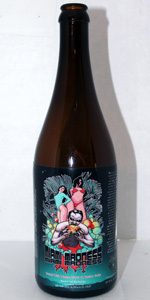 Taste is perfect tropical berliner explosion with lots of different sweetness' going on. This one is, without a doubt, 5 across the board. L: beautiful cloudy yellow body, with nice white head. T: passion fruit up front, with mango/guava after a few swigs. F: extremely smooth, + very creamy. This beer should be 100. On tap at Toppling Goliath. Pours a light, hazy yellow-orange body, one finger white head, minimal retention, not much lacing. Smells of guava, passion fruit, mango. Lots of tropical fruit here; mild lactic presence. Smells fantastic, full of fruit. Flavour is similarly fruit-forward, passion fruit, mango, guava, all of that, with a mild-moderate lactic acidity in the background. Not a whole lot else. Again, this isn't particularly complex outside of the fruit, but the fruit is nailed quite well. Mouthfeel is medium bodied, crisp, refreshing, super easy to drink. Mostly tropical fruit on the backend. Overall, this was a very fruit-forward berliner with a lot of tropical fruit character. I certainly preferred DFPF to this, but this is really good.